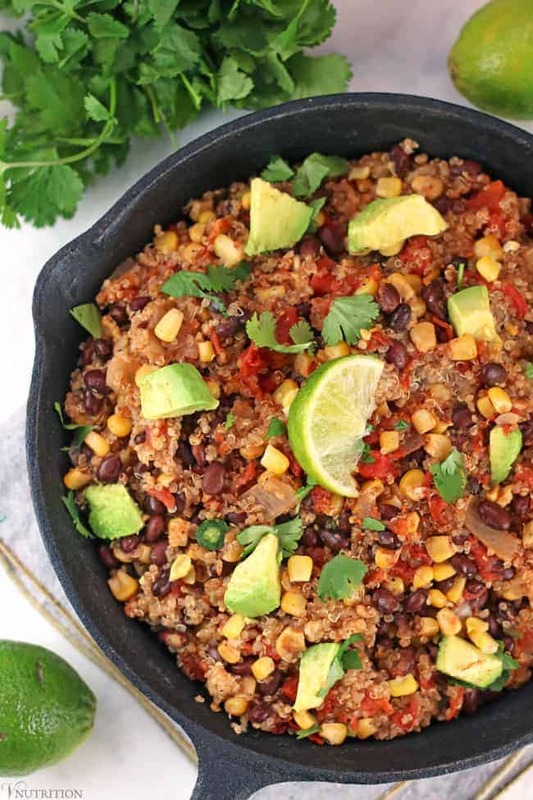 This one-pot southwest quinoa is so easy to make and captures the flavors of Southwestern food. It’s gluten-free & oil-free yet incredibly tasty and perfect for a quick weeknight dinner. I’ve always loved Southwest/Mexican food but I used to feel so heavy after eating it. Looking back, I realize it was the dairy-laden cheese and sauces that are typically abundant in those dishes. I’ve re-vamped a few of my old favorites to make them vegan-friendly like my Vegan Chipotle Queso. 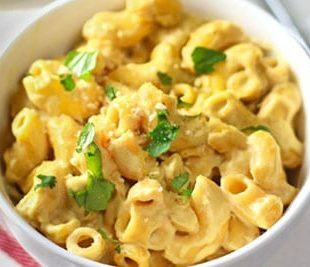 Seriously check that dip out if you you want a dairy-free cheesy alternative – it’s delicious! Another dish that I made plant-based which I think captures the essence of Southwestern food is this southwest quinoa. It’s a delicious meal without all the lethargy I used to feel after eating those dishes filled with dairy. Quinoa can be used in so many ways. 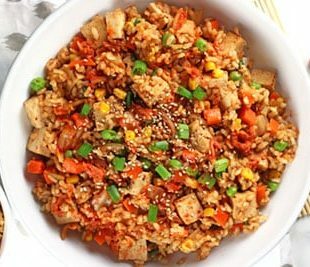 You can use it in place of rice in any dish. I have quinoa for dinner a number of times each month because it’s so tasty and cooks in about 15 minutes. Another benefit to quinoa is all its nutritional properties. One cup of quinoa contains over 8g of protein and 21% of the recommended amount of dietary fiber. Quinoa is also a good source of iron as well as whole grain carbohydrates. 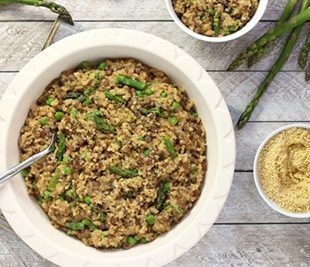 Meal Prep Tip: I make a big batch of grain (brown rice, quinoa, wild rice) every Sunday or Monday to add to make quick meals throughout the week (like this southwest quinoa) . 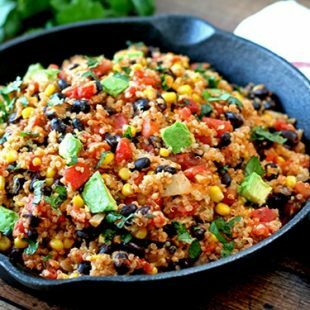 I love my Southwest Quinoa because it’s so easy to make. For this dish, you seriously only have to heat a pan, cut up some veggies, and toss in your already cooked quinoa. Like I said above, this dish only takes about 20 minutes to make in total (which includes all the prep work) if you pre-cook the quinoa on the weekend. I always have a grain prepped so that I can make quick meals like this during the week when I’m short on time. For more info on how to meal prep like a boss, check out my Vegan Meal Prep Tips. 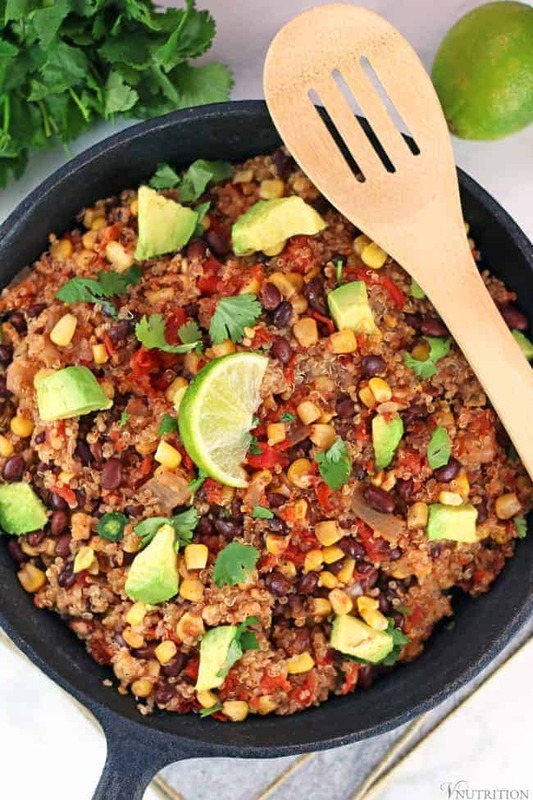 If you make this Southwest Quinoa recipe, let me know what you think by ★ star rating it and leaving a comment below. 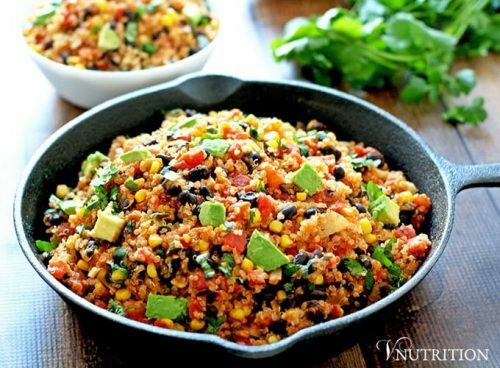 This southwest quinoa captures the flavors of Southwestern food by adding corn, tomatoes, and avocado and leaving out the dairy. In a large skillet, heat vegetable broth, onion, and garlic and cook until for 3 mins. Add corn and zucchini and cook for another 2-3 mins. Add beans, tomatoes, chili powder, paprika, and pepper and cook for about 5 minutes. If you need more liquid, you can add some veggie broth or water. Turn off heat and add in cooked quinoa to skillet and fluff with fork until quinoa is heated through. Remove from heat top with add the avocado, cilantro, and lime juice. When I use this recipe for meal prep, I make it everything but the avocado. When I'm ready to eat, I slice and add the avocado then so it doesn't get brown in the fridge. This looks wonderful, I love quinoa as an energizing food. It’s perfect for a pre-race dinner, thanks! 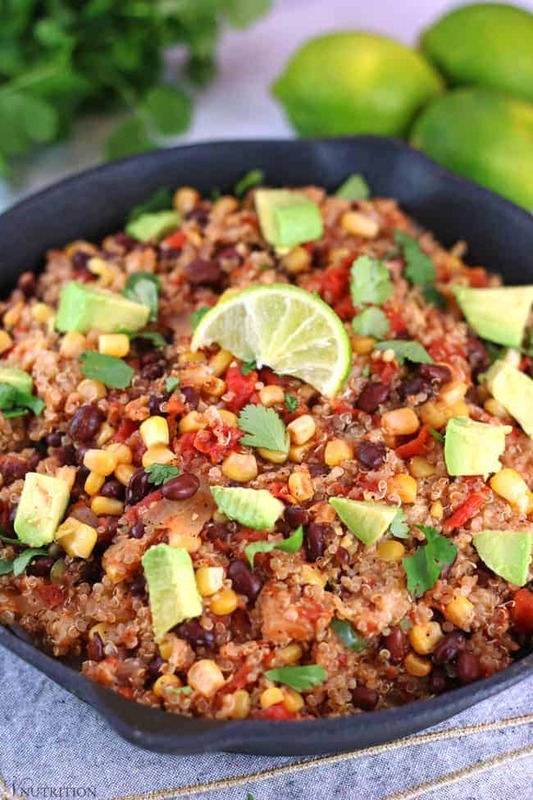 I really love your photography for this southwest quinoa Mary! That lighting is perfection 🙂 that’s also a really great idea to cook a grain at the start of the week to use throughout the week, I should start doing that too! Aw, thanks Kyra! I’ve been trying to work more on my photography. Which means I can’t do as many recipes but the photos are better. 🙂 Yes, making a big batch of grain at the beginning of the week has helped me so much. Looks so pretty! And delicious. 🙂 Thanks for linking up! This looks delicious, and of course nutritious! I’m right there with you on the Southwest/Mexican food love, I just can’t get enough! This looks wonderful! I love all the colors & can’t wait to try this healthy dish! Pinned 🙂 Thank you so much for joining the Link-Up!! I am totally going to make this on Friday for my friend Robin as we’ve both been super stressed and could use a healthful & delicious salad for lunch. Thanks so much for sharing this at Healthy Vegan Fridays – I’m featuring this on Friday. I’m pinning & sharing (and making!). Have a great week Mary Ellen! Robin and I LOVED it! It was so good. Exactly what we needed to plow through our meeting and organizing last minute details. YUM. I’m so glad you liked it Kimmy!! Now this is my kind of healthy, hearty, chunky and satisfying way to enjoy quinoa! This recipe really kicks basic quinoa up a notch! Thanks for sharing your Southwest Quinoa with us at the Healthy Happy Green & Natural Party. I’m pinning and sharing. What a yummy combination. 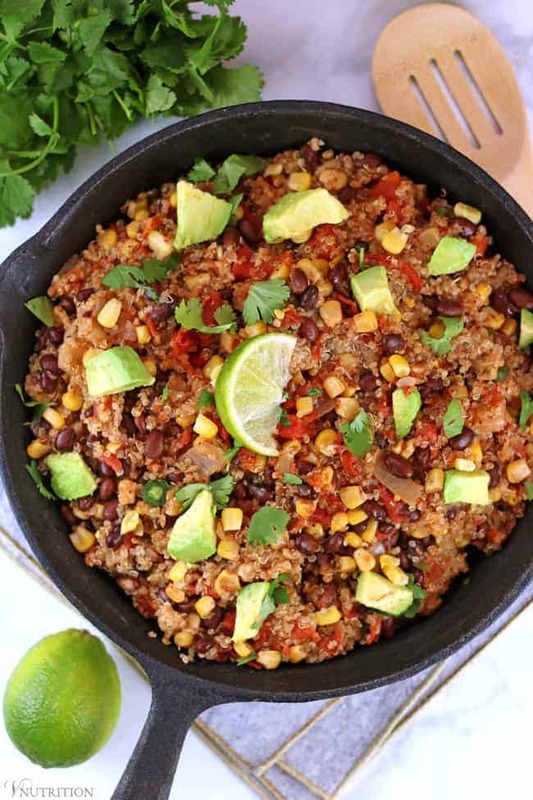 My friends and family will love this hearty Southwest Quinoa recipe-and so will I. I have to make this delectable dish soon! Thanks for sharing this at the Plant-Based Potluck Party. I’m pinning and sharing! I made this last night, I omitted the jalapeno but it came out delicious. Everyone loved it. Thank you! Cori, I’m so glad you liked it! Thank you so much for letting me know! That made my day! I’m so happy both you and your little one enjoyed it, Brytne!